Since 2012, Signkick has been on a mission to make the planning and purchase of Out Of Home advertising simpler, more automated and connected. We are pleased to announce the next step in this journey, which will enable us to achieve this mission better than ever before. As of today, the company will be divided into two entities – Signkick and Bubble Outdoor. The rapidly expanding SaaS software side of the business, formerly SignkickTech, will take the name and brand forward. While the online OOH media sales platform, formerly known as Signkick, will be rebranded as Bubble Outdoor. Signkick will be headquartered in Bristol, UK, with a development office in Amsterdam, and concentrate on delivering software for media owners, led by and CEO Tobias van Amstel with support from CTO Sebastiaan Schinkel and CCO Andy Hamblin. 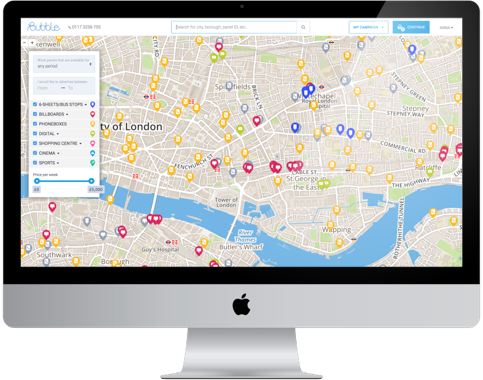 “It has become increasingly obvious, through our conversations with media owners, that there is a real demand for high-quality, self-branded software, that automates the planning, purchase and delivery of their OOH offering.” Andrew Hamblin. Signkick’s flexible, cloud-based SaaS products are created exclusively for media owners, helping them to make the planning, purchase and execution of their OOH advertising spaces simpler, more automated and connected. Bubble Outdoor will operate the online platform at bubbleoutdoor.com, enabling live automatic trading for businesses and individuals searching, planning and purchasing OOH advertising. Bubble Outdoor will continue with guidance from industry stalwart Nick Jarman (founder of Talon Outdoor) and an experienced media team including Matt Stubbings (formerly Kinetic WW, Primesight and Posterscope) and Louise Chick (formerly Rapport). “With both Signkick and Bubble Outdoor growing at pace, we believe that splitting the company will ensure we deliver on their potential in a way that best serves our customers. We are very excited about their futures” Tobias van Amstel, Signkick.